These words from the letter of James struck me this week - they were part of the daily readings on Wednesday. They cut right through me. 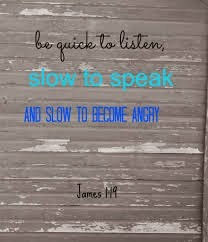 I can't tell you how many times I have been slow to hear, quick to speak and quick to become angry. These words have echoed through my mind over and over. I ask myself - how can I be "quick to hear"? I want to speak before the other person is done talking. I want to make my point before I forget it. I want to "solve" their problem or offer unsolicited advice. Part of being quick to hear is understanding that not everyone who tells you about their life wants advice. Ouch. That's a real problem. I always have something to say and it frequently results in putting my foot in my mouth. It's a horrible feeling to look back on the day and regret so many things you said that didn't need to be said. Words that hurt, that tear down, that spread negative attitudes - it doesn't matter if you intended to bring hurt and negativity. You did. If you have ever spent time with preschool age children, you know that controlling anger is a difficult skill to learn. Why do I need to control my temper? It's the way I feel and I can't help how I feel! By the time kids are in second grade they understand that while they can't control their emotions, they need to have enough self-control so their anger doesn't lead them. Sometimes I think I need to go back to kindergarten. I keep reading these words and I do see a pattern. It's the way of Christ. It begins with being quick to hear. Listening. Hearing. Chewing on the words, the body language, the messages of others, the meaning. If I'm keeping the hearing slow, that keeps me from speaking too quickly. Do I really need to say something? Will my words have a positive impact? Does my yes mean yes and my no mean no? If I'm slow to speak it makes it less likely that my anger will escape. I won't have to go back to preschool. Outbursts of anger aren't just embarrassing, they are destructive. Anger does not accomplish the righteousness of God. I believe God wants to use us to be the light of Christ. I can't see the person of Jesus, but I can see Him in my brothers and sisters who are quick to hear, slow to speak and slow to anger. They show me there is an alternative to the noise, the arguing, the constant assault of sound. It's peace. Peace is my word this year and I may just find it if I listen more, speak less and keep my anger in check. What About the Saint in Valentine's Day? The day traditionally associated with love and romance is nearly upon us. 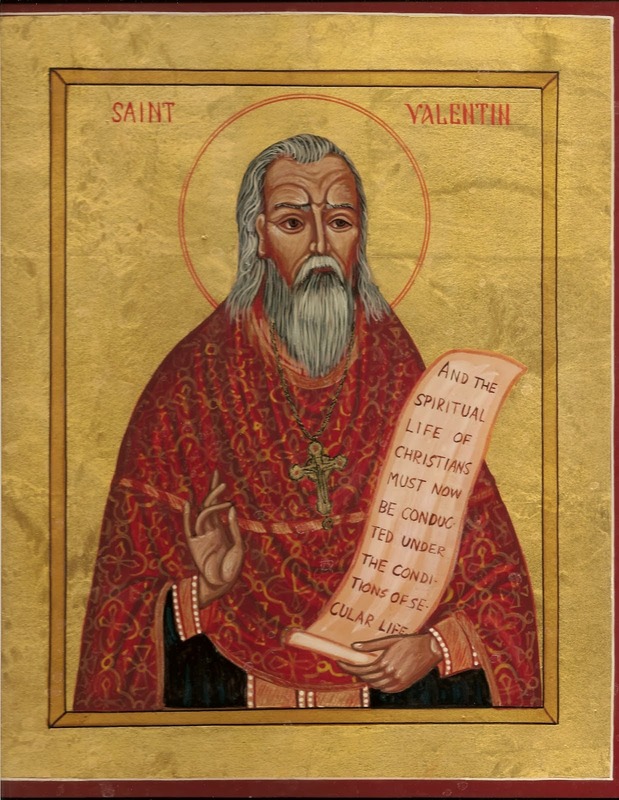 Friday is the feast of St. Valentine, but much of the world might not realize that. So just who was St. Valentine and how is he connected with love? There are many St. Valentines in the Roman calendar (Valentinus was a popular name), but the one celebrated on February 14 may be one or two people. There was a martyred third century bishop named Valentine, but also a Roman priest by the same name who was martyred under the rule of the Emperor Claudius. There is also a theory that these descriptions are of the same person. One thing we do know - this man was martyred for his faith. As a pope in the fifth century noted, Valentine's acts are known to God alone, and that was probably good enough for Valentine. So why is this saint connected with hearts and flowers? It has nothing to do with the man, at least not St. Valentine. The connection lies with Geoffrey Chaucer and his poem Parlement of Foules (1382). In modern English: "For this was on St. Valentine's day when every bird comes there to choose his mate." Birds, mates, flowers, candy, cards - you get it. I still think this saint is associated with love. St. Valentine, whoever he was, loved God enough to die for Him. My mother's name was Mary. She was a really good mom and I loved her. She was strong in her faith and I would like to think I share that with her. She didn't talk about it much, but I know she believed in the power of prayer. Like most people, when I had problems, I talked to my mom. I asked her help. I knew she would do anything she could for me even if she could not directly solve the problem. 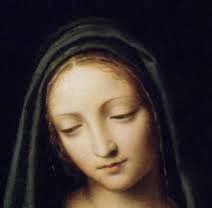 One of the most common misunderstandings non-Catholics have about Catholicism is our devotion to Jesus' mom, Mary. We call her the Blessed Virgin, Our Lady, Mother of God, Queen of Heaven and many, many more titles, but bottom line, she's Jesus' mom. We don't see that as just another woman in the salvation story. She's His mom. When we were planning our wedding, I told the parish administrator who was with our ceremony that I wanted to include "flowers to Mary," a moment where I could take flowers to a statue of Mary and say a prayer. I was told that they didn't do that unless there was a specific devotion to Mary. I told them I had a special devotion. I'm not sure if I really considered it that at the time, but it was important to me to include it in our wedding. I remember asking Mary to pray for our marriage. I think a lot of people don't understand what it means to "pray" to Mary. I don't think Mary has the ability to do things only God can do. When I "prayed" to her during my wedding, I wasn't asking for her to do anything really supernatural. I was just asking her to join me in praying for our marriage. I know my mother was praying, why wouldn't I want Jesus' mother interceding for His blessing on our marriage? When we were having difficulties having a baby, there was a moment in the Cathedral Basilica of St. Francis of Assisi in Santa Fe, New Mexico where I said a prayer before an image of Mary. I didn't realize it at the time, but it was La Conquistadora, Our Lady of the Rosary, the oldest image of Mary in the Americas. I laid it all there - my fears, the pressure, all of it. As I stood up, I felt a real sense of release. I knew there was another person helping me. It's the same kind of thing I would ask my mom. I recognize that a devotion to Mary and her unique role in the Church can't be fully described in this short post. However, I do think it's a starting point to understanding of how she helps me, mothers me, intercedes for me. After all, if you want help trying to persuade a guy to do something, who better to ask than his mother, right?